Ian Valentine is a Los Angeles-based computer artist, known primarily for his virtual realism exploring the identity and distortion of human forms. Valentine’s exhibition for the Made in NY Media Center, Passion Fruit, ventures deeper into virtual space and loses the figure entirely. 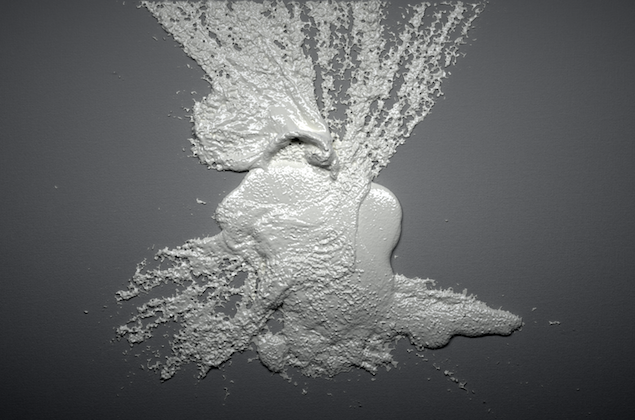 Presented as a five-minute video installation, Passion Fruit is the culmination of over fifteen hundred hours of simulated fluid dynamics across multiple computers over a period of five months. The result is a primitive digital gesture that offers a new lens through which to view the the act and performance of painting, rediscovering the inherent viscosity and physicality of the liquid in an entirely virtual landscape. Ian Valentine is a computer artist living and working in Los Angeles, California. His solo and collaborative work has been exhibited throughout the United States, as well as featured on Adult Swim and Vice's Creator's Project.